Back ache, well I hate it and get it quite regularly and have over the years been given many explanations as to what it could be or what might be causing it, everything from my posture to how I sleep, to how I sit or the fact it might well be hereditary. Whatever the cause it can sometimes be so painful that sitting down or laying down prove to be too painful for more than a few minutes, hot water bottles and baths are often a quick cure but the pain soon returns. Thankfully this isn't a problem I have to face everyday. So, over the years, I have tried visiting a chiropractor, acupuncture, going to the gym to exercise, Pilates, swimming, Yoga and all known kinds of pain relief, rubs, hot stones and so on. Then a friend of mine suggested that I try a Shakti Mat, like me she too suffers from back ache and using a Shakti mat had been suggested to her some months ago during a yoga class and she duly bought one and now swears it is the only relief worth thinking about. So if it worked for her, it might work for me and I too duly bought one. I am not someone who is into all of this healthy lifestyle come alternative medicinal cures admittedly and if I am honest I found yoga too boring and Pilates more boring than boring could possibly be, so I had never heard of a Shakti Mat never mind pronouncing it, though I was later informed it is pronounced Shack-tee and did read up about them before purchasing, be warned however that if you type Shakti Mat into Google you will get over 195,000 pages of information of which 90% of it isn't of any use, so I used the official website to gather my information and it is here that you can read about the history of Shakti and its invention. So what is a Shakti Mat? 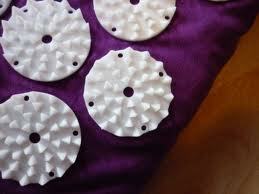 Some say it is a modern invention of the Indian bed of nails and to other it is known as an Acupressure Mat. The Shakti Mat is said to promote the release of large quantities of endorphins, the well-being hormone, as well as a range of other calming hormones, increases blood circulation and the uptake of oxygen thus has a very rejuvenating and relaxing effect. Added to that, according to research done in Russian hospitals A Shakti Mat promotes a decrease in pain, resolves stress, strengthens the immune system, increases the metabolism and decreases inflammation. For me the most important aspect of this Mat was that it decreases pain and inflammation, anything else was and is an added bonus. To look at a Shakti Mat is quite striking, they are usually available in an array of colours and when I purchased mine the option was purple, green, black or a bright orange and I opted for purple. One side of this mat is a deep black colour and has a detachable rubber foam mattress which is about 3cm thick. The mat itself in size it measures at roughly 44cm long and between 5-10 cm wide. On the other side of the mat the first thing you notice is some button shapes with spikes sticking out which do feel quite sharp on the tips of your fingers, hence why some people refer to it as the modern invention of the bed of nails, however it is these spikes which stimulate blood flow and endorphin release as well as treating your body with acupressure. On this mat there are 210 of these white buttons on each of them is approximately 42 spikes giving 8820 points of acupressure. If you place the palm of your hand over one and press down, it does hurt, so part of using this Mat is learning about how to use it and making sure you use it right and thankfully my own Mat came with an instruction guide which gave the briefest of details in how to use the Mat, but I actually found a few Youtube videos much more helpful. So to use your Shakti Mat you can either lay it on the floor or on your bed and then you need a rolled up towel so that it looks like a Swiss roll and this is placed under your Shakti Mat to support your neck as you lie down. Next poses the question as to what is suitable to wear? I usually wear my gym leggings and top, which are not thick material but I refuse to lay it on completely naked, which of course you can choose to do. Then as you slowly and trust me, I mean very slowly rest your skin so that it comes into contact with the points you need to relax and breathe as you lower yourself down. The best piece of advice I was given when I first started to use my Shakti Mat was to lay a thin piece of cloth between myself and the Mat, in my case it was a sheet and this made a little bit of difference, part of the learning curve with these mats is learning how to use them properly so they become effective and for the first few times of using them, they are deeply uncomfortable and slightly painful and can be likened to a warm pricking feel, but you do have to persevere with it and keep trying to ensure that it begins to work for you. Then once you have got yourself used to the mat it is said that you should initially aim to use it for 10-15minutes, whilst laying on your Mat you are asked to relax and breathe and let the acupressure points work their magic and then as you grow in confidence with your Mat up the amount of time you spend on it to half an hour to an hour at a time although you can fall asleep it on without it causing any harm, so if you do happen to drift off into a slumber, which I have done a few times, then there is nothing to worry about. The main thing is that you use the mat whenever you have time, preferably every day. After a few sessions of lying on your mat you should be able to feel less stressed and refreshed and you can use these mats in your place of work if you feel comfortable in doing so, as long as you can find somewhere suitable and quiet to re-energize your batteries. The Shakti mat can be used on most body parts and not just your back. You can use it on your knees, legs, thighs, stomach (although extra care is needed), feet, Jaw and even your neck. Used correctly the Shakti Mat can ease and relieve you of most pains. As well as my back, I also like to sit down on the soft and use the walking motion with my feet on the Mat to ease sore and tired feet if I cant be bothered with the foot spa and I have also used it for my neck when I have pulled a muscle, although like the stomach extra care does need to be taken on any body part because the spikes are sharp. Taking all of this onboard the main question is how does the Shakti mat promote relaxation and relieve pain? Those 8820 spikes that I mentioned earlier in this review are the key to that. The spikes stimulate the nerves in the body and sends impulses to those points within your brain and promotes the release of endorphins which are natural chemicals produced by the body to reduce pain and stress. The one thing I like about this product is that it is easy to look after and maintain. It came with an accompanying bag which I store my mat in and it is really easy to roll back up, much like a sleeping bag and store it. Then to wash it you need to wash it by hand and with warm water, it cannot go into a washing machine or a tumble dryer because it could damage the spikes, however you can hang it out to dry on your washing line with all of your other items. So now you have read all about the Shakti Mat you want to know whether or not it works. Actually I was skeptical when I first started to use it because like a hot bath, the pain soon vanished after using it for 15 to 20 minutes at a time and then a few days later the pain would come back and I have preserved with the Mat and continued to use it and I have increased my usage of it and use it everyday when and where possible to do so and yes my back pain is now much more manageable and I am not taking any pain relief such as Ibuprofen or Aspirin at all and I haven't felt the need to seek any more help from my doctor, so for me this is a form of pain relief, it isn't a cure and the pain doesn't vanish completely but it does make life much easier and much more comfortable and if I have to spend 15-20 and sometimes 40 minutes at a time laying still on my Mat, then do that I shall. I paid £25 for my Shakti Mat which came with a storage cover and you can purchase them online from retailers such as Amazon and the price can range from £19.99 right up to over £40, so if this is something you are thinking of trying then I would shop around and pay for something you are comfortable with. For me, well I love my little Mat and I am glad it does work and I don't think I will be giving it up anytime soon. I know the yantra mat is supposedly really good for insomnia, arthritis and stress relief! Worth a shot if you ask me! I have read your interesting blog related to acupressure mats. These are very interesting facts covered on this blog.